Here at Greens, we believe everyone should enjoy local, seasonal, comfort food regardless of their diet. Offering a range of unique dishes, we cater for a number of dietary requirements such as vegan, vegetarian, dairy – free, gluten – free and coeliac. 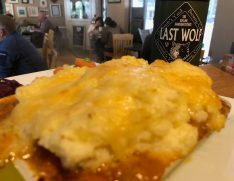 Our customers love our homemade shepherd’s pie, local fell bread lamb, topped with cheesy mash and served with fresh vegetables. We make it ourselves gluten-free, but for those who require dairy free we can leave out the butter in the mash and substitute with sunflower spread and replace the cheese on the top with vegan cheese. We also make a vegetarian version with a three-bean stew which is gluten-free and can be made vegan by using the sunflower spread and soya milk in the mash and vegan cheese on the top. All versions are served with either a freshly made salad or fresh vegetables prepared and cooked by us. We even do kids’ versions for smaller tummies following specific diets.